Interested in Buck Terell Athletics Equipment? Call us at 713-673-2577 or click here to get started on a quote today! 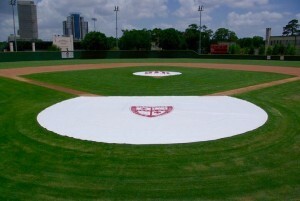 Designed to provide safety and protection BTA backstop pads feature an 18 oz. heavy-duty vinyl construction with high-density urethane foam filling. The padding is available with treated plywood backing for attaching to a brick wall or an all vinyl construction with snaps on the backside for easy attachment to a chain-link fence. 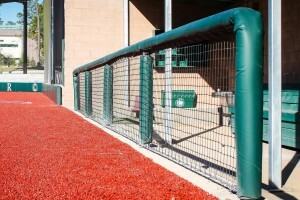 BTA backstop pads are custom made to fit any size wall. Custom graphics are available. Call (713) 673-2577 to specify artwork and/or pricing. "The Buck Terrell Pits (HJ/PV ) that we have were great. Very durable and have proven to stand up to West Texas weather. The Pits are everything we wanted and more"
"Just wanted to let you know that our baseball/softball coaches are very grateful for the new padding which was added to our softball/baseball fields. It not only provides safety but really dresses up the appearance of the facilities. We appreciate your professional workmanship and follow up service." 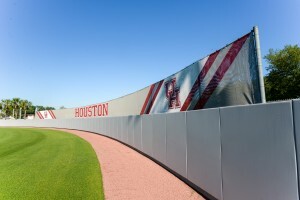 “Buck Terrell Athletics has provided the University of Houston track and field program with quality equipment and excellent service for over 25 years. It has been a pleasure to work with Phillip Terrell and his staff over the years, and we will continue to exclusively use Buck Terrell athletics for our equipment needs." "Buck Terrell Athletics products are unmatchable due to the quality, aesthetic appeal and durability! The staff's professionalism and passion to support their customers is why Alvin ISD will continue to have a longtime partnership with Buck Terrell! Over 25 years and still counting!" 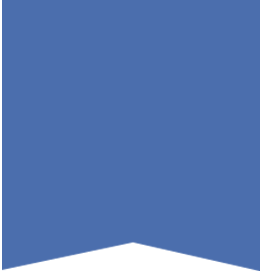 © 2014-2015 Buck Terrell Athletics. All rights reserved.